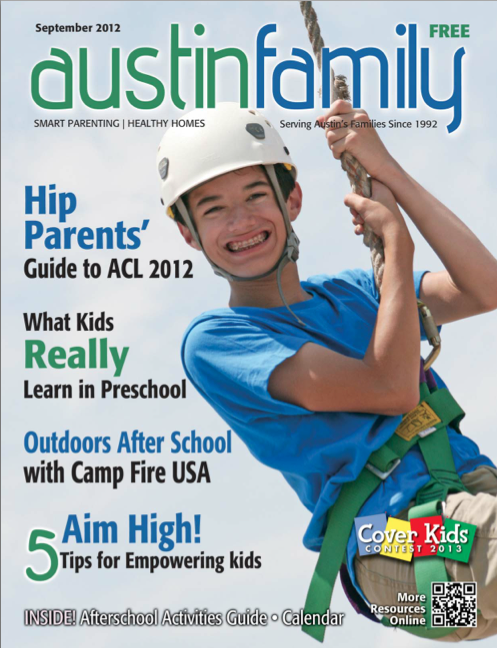 Austin Family Magazine contains information about fun activities for kids living in and around Austin, Texas. You might remember that a number of months ago, I entered one of the magazine’s contests and was one of six winners chosen to have their picture on the cover of the magazine! Well the time has arrived, and my picture is on the September issue of the magazine. Also, the magazine, along with my cover picture, will be featured each Friday morning during the month of September during the show “Good Day” on the local Austin FOX affiliate KTBC channel 7. My “photo shoot” was held at the Twin Lakes YMCA in Cedar Park, where I got to zip-line and rock climb. The YMCA is a beautiful property with two lakes offering all sorts of nature oriented activities including canoeing, kayaking, swimming, and hiking. I spent part of the afternoon there but I could have spent the entire day! Austin Family Magazine is a free publication available at over 500 locations in the Austin metro area from Kyle to Georgetown including HEB, Whole Foods, Central Market, Randalls, Sam’s Club, Regal Cinemas, as well as schools, libraries, and recreation centers, so be sure to pick-up your copy soon! Many thanks to Austin Family Magazine for a great day and for talking about my work helping to teach kids of all ages about invasive species! My 9-year-old son and I first saw you at the Wildflower Center and have enjoyed your videos. Congratulations on your magazine cover. You are a fantastic role model for my son! Thank you so much for visiting my blog and the kind comments! So glad your son enjoyed the Invasive Hunter Academy! That is really exciting news, Ben! Congrats! Thanks so much! You bet I’ll save you a copy!! !